Reading through the poems in this collection, The Ghost of Zina, made me look at poetry differently. The author here is someone I would call courageous, because poems to me have always been a window into the poet’s mind, and I have not built enough courage to allow me show some very personal poems to others, let alone publish them. That is because, I view my poetry as the chapters of my life in segments. That aside, I write according to how I feel at a particular time, but people might read it and recognize themselves and feel hurt or something. I really need to toughen up. Charles Ayo Dada, the author lets his reader into his mind, to see the pains he felt at losing his love. Very interesting book and I strongly recommend it. 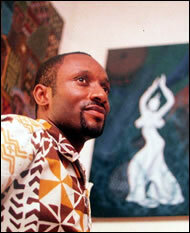 Apart from being a writer, Charles Ayo Dada runs The Sholman Gallery in Ikeja Lagos.